If you have been following this blog regularly you will already know that I have a designer crush of sorts on Ridhi Mehra and Anushree Reddy. I love how these two designers incorporate florals in ethnic wear and present some fun cuts and silhouettes. 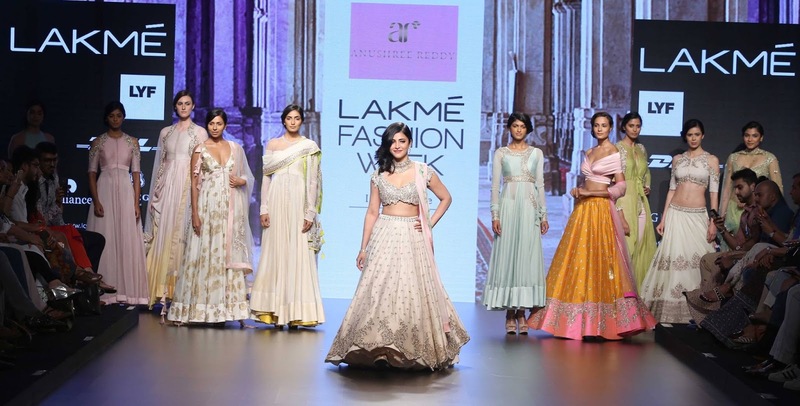 At Lakme Fashion week Spring/ Summer 2016 like always i kept a close watch on these two designers and here I bring to complete coverage of Anushree Reddy . 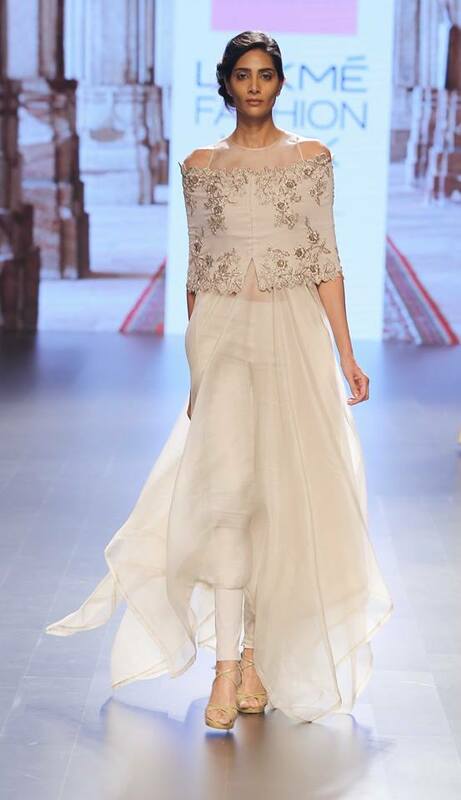 Anushree Reddys collection was titled Mughal India drawing inspiration from the Mughal Dynasty (where else?). The fabrics used were silk, mulmuls and cotton and the colour pallet was mainly soft pinks, blues and ivory. This time around Anushree Reddy show left me a bit under whelmed mainly because the colour pallette was too dull and the floral toned down. I know over the top isnt good but when it comes to Indian wedding (to whom anushree mainly caters) Over the top is good and actually loved. Weddings these days are getting all toned down and brides prefer pastels so this collection isnt entirely a disappointment and may actually find a lot of fans from contemporary summer brides to be. This time the collection had lot of whites and the blouses were very modern with cut outs. This one is my top favourite. I love everything about this, the sleeve design, the summery colour and the cut below the bust. Tailor made for your mehendi or Haldi. Pair this woth cropped pants and have a uber stylish mehendi. 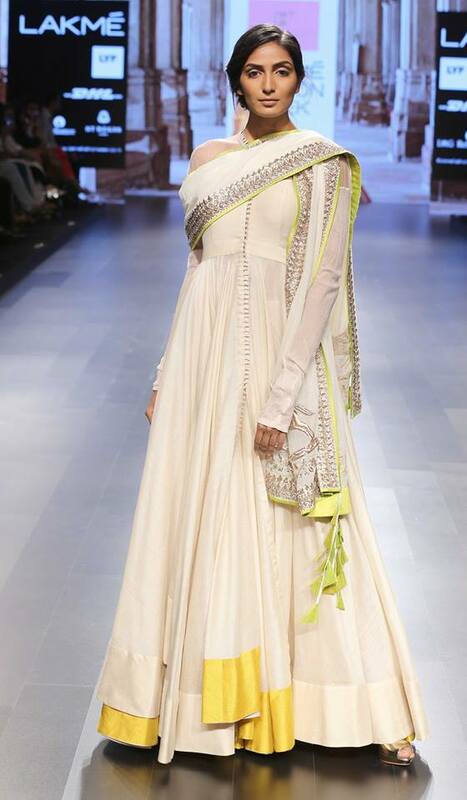 Iam not a Fan of whites but this ivory anarkali with a dash of lime and yellow has me hooked. The silver work gives this a bit of glam . The semi sheer Top. Love. Ombre Anarkali with signature chiffon dupatta. Perfect for mehendi. Pale blue, a pantone color of the year , i like the cuts and layers in the flare. Good option for your sangeet. I have a thing for front slit anarkalis, they lend outfit an indo western vibe. This is again good option for Mehendi. 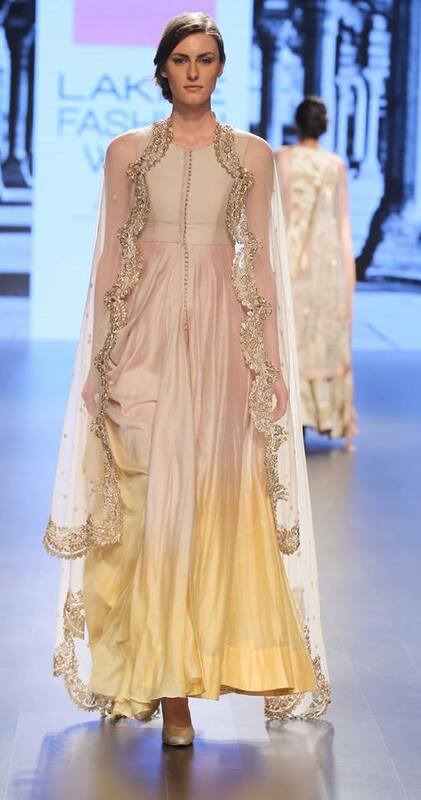 What do you think about this collection of Anushree Reddy?